Want to sell your products to the people who keep all of us moving? Find potential customers at new and used car dealers, motorcycle dealers, gasoline service stations, and even automobile supply stores easily with this automotive dealers email database. Is your marketing campaign running on empty? If so, supercharge it with this new and used car dealer mailing list and you're sure to smoke the competition! 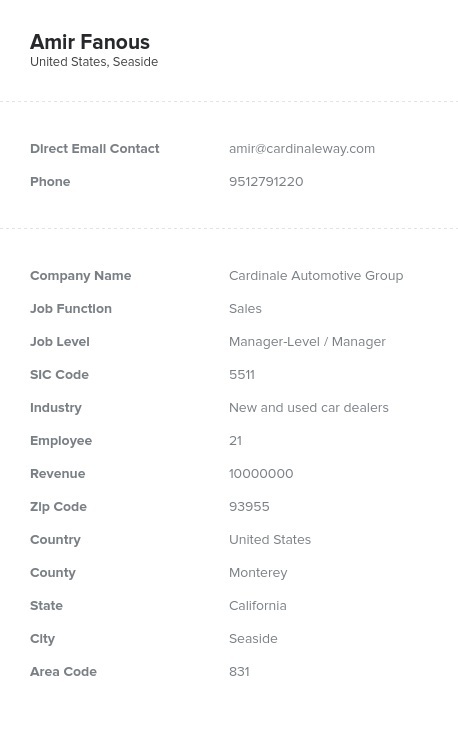 Our comprehensive automotive dealers email database contains the contact information you need to reach out to people who make buying decisions at car, truck, and motorcycle dealers, auto parts stores, and gas stations all over the country, including their real names, direct email addresses, verified mailing addresses, accurate phone numbers, company details, and even fax numbers. At Bookyourdata.com, we're driven to provide the most accurate, useful information possible, and that's why all of our B2B email lists, including this one, are double-authenticated on a regular basis. First, we put each business database through its paces in an automated verification process, and then, we examine each shred of data with human eyes. When you buy this car dealers email list, you'll be equipped with up-to-date information you can use right away to contact sales leads. In fact, if you find that more than five percent of your messages bounce back, just let us know and we'll give you more data to make up the difference. That's our commitment to making your marketing campaign a success.